SKU: BES870XL. The steam wand allows you to hand-texture the micro-foam necessary to enhance the flavor of the coffee and create latte art. 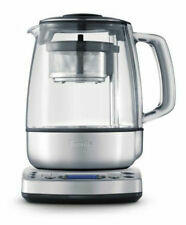 The machine also features a dedicated hot water outlet for hot water dispensing. 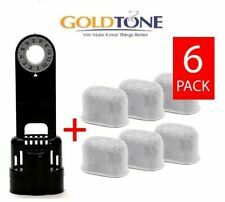 COMPATIBLE - These GoldTone Water Filters and Water Filter Holder are designed to fit Keurig 1.0 Brewers and Breville Coffee Makers and Brewers. Great coffee starts with great water. GoldTone water filter products elminate impurities found in your water. 4.5 out of 5 stars - Breville Infuser Espresso Machine (BES840XL) NEW! 65 product ratings65 product ratings - Breville Infuser Espresso Machine (BES840XL) NEW! Make sure this is the item you are looking for. FITS ALL BREVILLE MACHINES - These Breville compatible filters will fit all Breville coffee makers and Breville espresso machines, both newer machines and older machines. Great coffee starts with great water. Breville Espresso Machine 800ESXL - Triple Priming - Die Cast Brushed Stainless Steel Condition: Machine tested and in good working condition. Missing portafilter, and missing the tube frothing cover for the steam wand but still steamed milk up and made it frothy without it. There are some scuffs and marks on the machine (mainly back), and some calcification near the back under the catch tray which is not visible when in use (see red pencil in photos). Dollar bill for scale. Breville Smart Grinder Pro - Coffee Bean Grinder (BCG820BSSXL) NEW! 5 out of 5 stars - Breville Smart Grinder Pro - Coffee Bean Grinder (BCG820BSSXL) NEW! 8 product ratings8 product ratings - Breville Smart Grinder Pro - Coffee Bean Grinder (BCG820BSSXL) NEW! Breville Smart Grinder Pro BCG820BSSXL Stainless - **Complete & Clean**. I've had this grinder for about 18 months. Its a great all purpose grinder, espresso through french and everything in between. I only sell items I personally used, I'm not a reseller. I take great care of my stuff as reflected in my feedback. I took the burrs out and thoroughly cleaned them for the next owner. Grinder is complete with all original items, see pic of manual with actual accessories. Exterior of grinder is in great condition with no noticeable dents or scratches. I recently received a prosumer grade grinder for my birthday, so I no longer have a use for this. Shipping is actual as determined by ebay. I only shipped to confirmed US addresses, no exceptions. 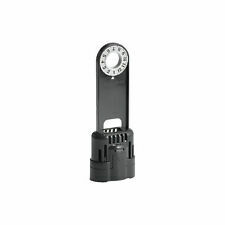 Fits the following Breville espresso machines Orders are usually processed within 24-48hrs. Box Contents: Nespresso Essenza Mini Espresso Machine by Breville, Instruction Booklet, Information Folder. 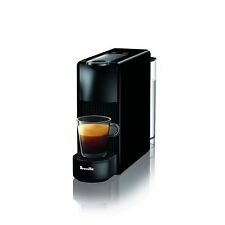 - Nespresso Essenza Mini Espresso Machine by Breville. Removable Water Tank: Yes. Pressure: 19 Bar. It operates at maximum power of 1600 Watt. This is in very good condition and works well. It comes with it’s double, single and pod baskets. It’s included a measuring spoon, cleaning tool and stainless steel carafe. 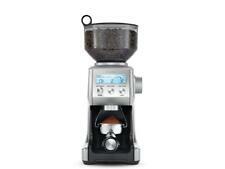 Breville Smart Coffee Espresso Grinder. Condition is Used. Shipped with USPS Parcel Select Ground. The in-built conical burr grinder allows you to grind only what you need directly into the portafilter. It's fully adjustable in grind size and dose, so you can adjust your coffee to the perfect taste you prefer. Geesta filters new in the box. Breville ESP8XL Cafe Roma Stainless Espresso Maker. Condition is Used very little . Shipped with USPS Priority Mail. Brevilla Cafe Roma Espresso Machine Parts (ONLY those shown). Trending at $549.99eBay determines this price through a machine learned model of the product's sale prices within the last 90 days. Used portafilter / group head handle for Breville espresso machine BES820. Used and showing signs of use but in good working order - see the pictures. 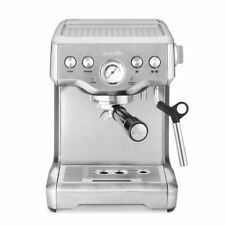 Breville Nespresso Vertuo Coffee Machine - Chrome - BNV250CR01BUC1. Condition is New. Received as gift and never opened. Box has some surface water damage but it hasn’t gone beyond the printing on the bottom of the box. This is a chance to get a quality machine at a very good price! This is brand new, unopened and unused! Shipped with USPS Priority Mail. **Note Seller will pay shipping via UPS, if the bids on the item reach $74.00** So, Free shipping after bidder(s) get to a “fair bargain amount” - Thanks for looking! 4 FOR SALE BREVILLE SMART (PRO) COFFEE GRINDER MAIN GEAR . Condition is Used. Shipped with USPS Parcel Select Ground. Machine ONLY! No accessories! Actual Photos of what you get. Nothing else included. Sold AS-IS. Grind Size Dial and Grind Amount Dial both feature pre-set and customizable settings to eliminate guesswork. The 15-bar pump pressure system is Italian designed and made, and the pressure gauge assists in optimum extraction pressure. 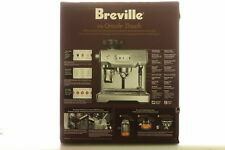 Breville BES980XL The Oracle Espresso Machine Coffee Maker - USED - . Condition is Used. Shipped with USPS Parcel Select Ground. I thought is was a coffee maker and grinder. I was wrong. Bought this for my coffee loving wife but is unneeded because we already have a grinder. This is new in box. Never opened and never used. 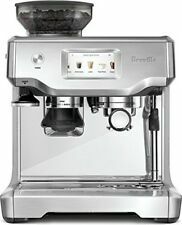 Breville Duo Temp Pro (BES810BSS) Espresso Machine Stainless Steel. Condition is Used. Shipped with USPS Priority Mail. COMPATIBLE - These GoldTone Water Filters and Water Filter Holder are designed to fit Keurig 2.0 Brewers and Breville Coffee Makers and Brewers. Great coffee starts with great water. GoldTone water filter products elminate impurities found in your water. Model: BNV250BKM1BUC. Aeroccino3 milk frother. Color: Black Matte. Coffee and espresso machine. 14oz, 7.7oz, and 1.35oz cup sizes. Doing that is against U.S. and international laws. We are not an authorized dealer of this product and any warranty included with the product may not be honored by the manufacturer. Breville ESP8XL 800ESXL BES820XL ESP6SXL BES250XL. 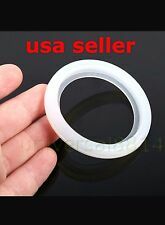 Adopted quality silicone material, safe and durable to use. Good product at acceptable price. Worth buying!Feature ESP8XL 800ESXL BES820XL ESP6SXL BES250XL. 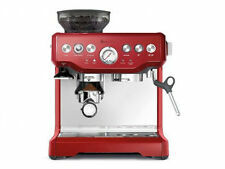 Breville Nespresso Inissia Original Espresso Machine (Red). The Breville Nespresso Inissia Original Espresso Machine (Red) takes making your morning coffee to the next level. With its super fast speed, small and compact size, two automatic and programmable cup sizes and more, your coffee will be made quicker, tastier and more efficient. Nw W WARRANTY Breville BES870XL Barista Express Espresso Machine STAINLESS STEEL. Condition is New. Shipped with USPS Parcel Select Ground. Trending at $1,900.00eBay determines this price through a machine learned model of the product's sale prices within the last 90 days. Do you Love your Breville Espresso Machine?. Well i do! Just for these simple seals! 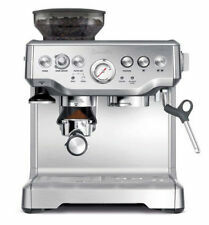 -Breville BES900XL. -Breville BES860XL. -Breville BES800XL. 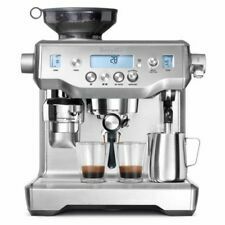 -Breville BES820XL. 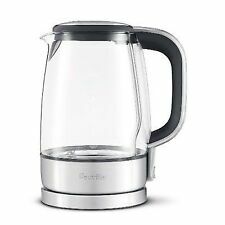 -Breville BES830XL. Breville Complete Cleaning Kit BES860XL. Condition is New. Shipped with USPS First Class Package. Product information. Filter Size: 2.2" x 1.14" x 1.3". Breville The Oracle Touch Coffee Machine. O-ring Kit - Breville Coffee Machine. Leaks? Tripping Breakers? Intuitive Touch Screen Display. Hands Free Operation. Automatic Micro-Foam Milk Texturing. Personalized Coffee Settings. 50mm Dual Wall (pressurized) two cup filter for Breville espresso machine 800ES and BES820. This item is used and shows signs of use, but it is in good working condition. Breville Barista Express Portafilter H. Condition is New. Shipped with USPS Parcel Select Ground. The Creatista plus can turn into your personal latte maker with the attached milk frother, allowing you to create top quality latte art in your kitchen. Pour over ice to create your favorite iced coffee drinks. Breville, Oracle, BES980XL Parts, Accessories New. Condition is New. Shipped with UPS Ground.